A trial at training grounds will take place before any on-course changes. Research at the University of Exeter - funded by the British Horseracing Authority (BHA) and Racing Foundation - showed horses adjusted their jump angles when orange was not used, with white tending to produce a longer total jump distance. Ian Popham, a Grade One-winning former jockey who was involved in the research, said: "From riding over the different coloured fences it was clear to me that over some colours the horses reacted differently and showed the obstacle more respect. "I'm sure other riders will feel the same and this feels like a great idea and opportunity to make the sport safer for both horses and jockeys." 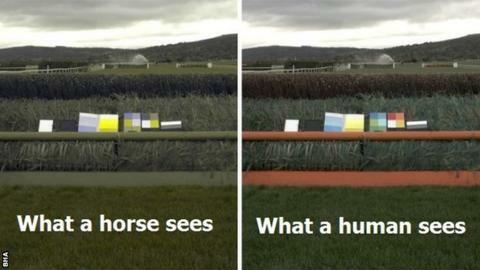 The BHA said horses cannot distinguish between as many colours as humans. The animals "differentiate objects in a palette of blues and yellows" and it is therefore hoped a change from orange on obstacles will "maximise visibility". A trial using fluorescent yellow for hurdles and guard-rails with a fluorescent white for take-off boards at fences, will now take place at training venues in order to gather more data. BHA figures show the rate in fallers at British races has declined by 29% since 2004 because of safety improvements. David Sykes, director of equine health and welfare for the BHA, said: "As with the ongoing phased introduction of our padded hurdles - which have proven to reduce faller and injury rates - we will ensure we take our time with this project, make sure there are no unintended consequences and that the evidence of the ongoing trials continue to support the case for change. "If that proves to be the case then we will look forward to seeing the new designs of hurdles and fences on racecourses, and hopefully further reducing our already declining faller rate." Welfare continues to be a major issue for the sport - more these days at the showpiece Cheltenham Festival following apparently successful alterations to the Grand National course - so this type of research showing that racing is being proactive on these matters is as important as it is - I think - fascinating. For the time being, the changes are being trialled away from the racecourse, but I'm sure it's only a matter of time before they're visible on track.